Registration is closed for this IB Workshop. Which workshops should I choose? • You are new to the faculty of a longstanding IB World School and have not taught in an IB programme previously. • You are aware of the IB philosophy and programme structure but are not experienced in teaching or administering the IB. • You are familiar with the IB subject guide (including assessment procedures, moderation) and would like greater confidence before teaching a course. • You have inherited a course and would like a review before teaching it to suit your own style and expertise. Choose category 3 workshops to go more deeply into areas you enjoy and to deepen your understanding and mastery of a particular area or subject. Please do not register for one workshop and expect to transfer to another on-site. THIS IS IMPOSSIBLE 95% OF THE TIME DUE TO SPACE AND MATERIALS! ***NOTICE: All Language B workshops offered in 2018 and beyond will cover the new Language B curriculum. The new curricula for IB Mathematics and IB English will not be released until early 2019. All workshops in 2019 will cover the new curricula for both Math and English. These workshops will be posted and available for registration beginning July 2018. If you have questions concerning any of the workshops, please contact info@flibs.org. All workshop participants should bring their Final Confirmation email and check in form that will be emailed prior to the workshop. Subject guides are provided by FLIBS for Category 1 participants. Category 2 and 3 participants should bring their own subject guides. *Note: Counseling, Coordination, and Administration do not need subject guides, etc. Workbooks designed by individual subject leaders will be provided by FLIBS for all courses. IBO has allowed Kent State University to offer IB teachers graduate education credit for IB workshops they complete at IB PYP, MYP and DP professional development conferences. The cost for 1 graduate credit is $220. In order to register for this opportunity, please visit the following website: http://www.kent.edu/ehhs/offices/pd/international-baccalaureate. Workshop participants are expected to make their own travel and hotel reservations. All sessions are held at The Tradewinds Island Grand Resort, 5500 Gulf Boulevard, St. Pete Beach, FL 33706. We encourage participants to take advantage of the special group rates FLIBS secures with the resort. To secure the FLIBS group rate, you must book your room by the hotel reservation deadline for this workshop. Otherwise, all hotel reservations are subject to higher room rates. To make a reservation now at The Tradewinds, click https://www.tradewindsresort.com/flibs18 or call Group Reservations at 800-808-9833. FLIBS has partnered with VIP Travel & Tours to assist with air and ground transportation packages for our workshop attendees. You may contact our representative, Ms. Ellen Lyons, to assist you in finding the best rates on round-trip airfare to Tampa International and ground transportation to the hotel. You may reach VIP at 800-441-8114 or email viptravel@centurylink.net. Please do not purchase your non-refundable airfare until FLIBS has sent you a Final Confirmation email. FLIBS reserves the right to withdraw any session due to low enrollment. If you are unable to secure a room at the TradeWinds Resort, we have a group rate at the Sirata Resort next door.­ For reservations, please call 855-344-5999 and mention that you are with the FLIBS Group. 6:00 pm - 7:00 pm -- Category 1.5 Session **Are you new to IB but at an experienced school? Do you have basic questions about the IB but are in a Cat. 2 workshop? If so.....plan to attend our Category 1.5 meeting right after the plenary. **Dietary concerns about meals will be addressed at the workshop check-in. 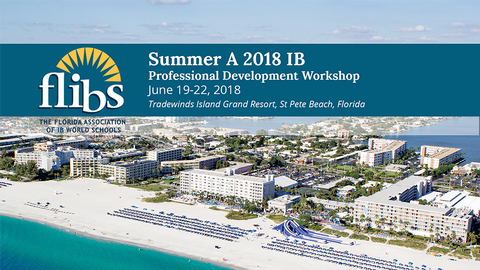 FLIBS workshops, in cooperation with IB Americas, cost $925.00 (USD) with a portion of the fee paid to the International Baccalaureate Organization for professional development support to make these workshops possible. Payments are accepted through the on-line payment system with all major credit cards. We also accept purchase orders, wire transfers, money orders and checks by mail to: Florida League of IB Schools, P.O. Box 551, Williston, Florida 32696 (USA). For wire transfer information, please contact info@flibs.org.